Illuminate your Hanukkah with this dazzling Judaica made of crystal. Glittering crystal chips dangle below, splashing the light of your holiday candles brilliantly across any room graced by this unique chanukah menorah measuring 20 centimeters atop a clear crystal base. Dazzle any Judaica collector with this unique crystal menorah measuring 20 centimeters in length . 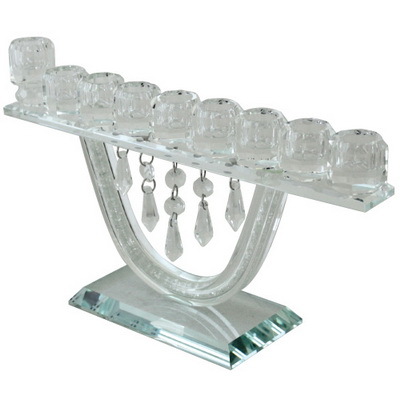 This particular menorah gives an elegant feel like a chandelier with the crystal chips falling below your candles, radiantly shining the light to all corners of your special space. SInce the times of the Great Temple, the menorah (or candelabrum) has held a significant and special place within the hearts of all Jewish people. Today, in crystal, this special Hannukiyah brings to mind the miracle of the 8 nights where oil which should have lasted for only one day lasted all 8. A Hannukiyah is a special type of menorah with 8 branches for each night of Chanukah, and another branch or holder for the Shamash, a special candle which lights all the others. The shamash here sits to the far side of all other candles.